The American Association of Physics Teachers have collated a set of educational resources on “Neutrinos: Teaching the science behind the 2015 Nobel Prize in Physics” (see The Cosmos, Section 12.7, pp. 322-325). Each second, the Sun converts 600 million tons of hydrogen into helium, and 99% of the energy generated arises from the so-called proton–proton chain. And 99.76% of the time, this chain starts when two protons form deuterium (hydrogen-2) by coming close enough together that one becomes a neutron, emitting a positron and a low-energy neutrino. It is this low-energy neutrino that physicists have now detected. Once this reaction occurs, two more quickly follow: a proton converts the newly minted deuterium into helium-3, which in most cases joins another helium-3 nucleus to yield helium-4 and two protons. Neutrinos normally pass through matter unimpeded and are therefore very difficult to detect. However, the neutrinos from this reaction in the Sun are especially elusive because of their low energy. The measurement therefore took scientists by surprise. Links: the full Physics World article; Borexino website. Scientists working on the neutrino experiment in the Italian National Institute for Nuclear Physics (INFN) Gran Sasso Laboratories have managed to measure the energy of our star in real time: the energy released today at the center of the Sun is exactly the same as that produced 100,000 years ago. For the first time in the history of scientific investigation of our star, solar energy has been measured at the very moment of its generation. The study was published on August 28, 2014, in the journal Nature. Borexino has managed to measure the Sun’s energy in real-time, detecting the neutrinos produced by nuclear reactions inside the solar mass: these particles take only a few seconds to escape from it and eight minutes to reach us. Previous measurements of solar energy, on the other hand, have always taken place on radiation (photons) which currently illuminate and heat the Earth and which refer to the same nuclear reactions, but which took place over a hundred thousand years ago: this, in fact, is the time it takes, on average, for the energy to travel through the dense solar matter and reach its surface. The comparison between the neutrino measurement now published by Borexino and the previous measurements concerning the emission of radiant energy from the Sun shows that solar activity has not changed in the last one hundred thousand years. The Borexino detector, installed in the INFN underground Laboratories of Gran Sasso, has managed to measure the flux of neutrinos produced inside the Sun in the fusion reaction of two hydrogen nuclei to form a deuterium nucleus: this is the seed reaction of the nuclear fusion cycle which produces about 99% of the solar energy. Up until now, Borexino had managed to measure the neutrinos from nuclear reactions that were part of the chain originated by this reaction or belonging to secondary chains, which contribute significantly less to the generation of solar energy, but which were central to the discovery of certain crucial physical properties of this “ephemeral” elementary particle, the neutrino. Links: Full INFN press release on Interactions.org; Borexino homepage. An article in ScienceNews reports that data from the IceCube experiment under Antarctic ice have shown that the highest energy neutrinos they detect come from all directions, indicating that they are probably at cosmological distances (see Section 12.7c, pp. 324-325). The results were first announced at the American Physical Society’s meeting in April 2014. Neutrinos open a window into the very distant and high-energy Universe that is extremely difficult to access by any other means. This is because neutrinos, unlike every other subatomic particle, are electrically neutral and rarely interact with matter. 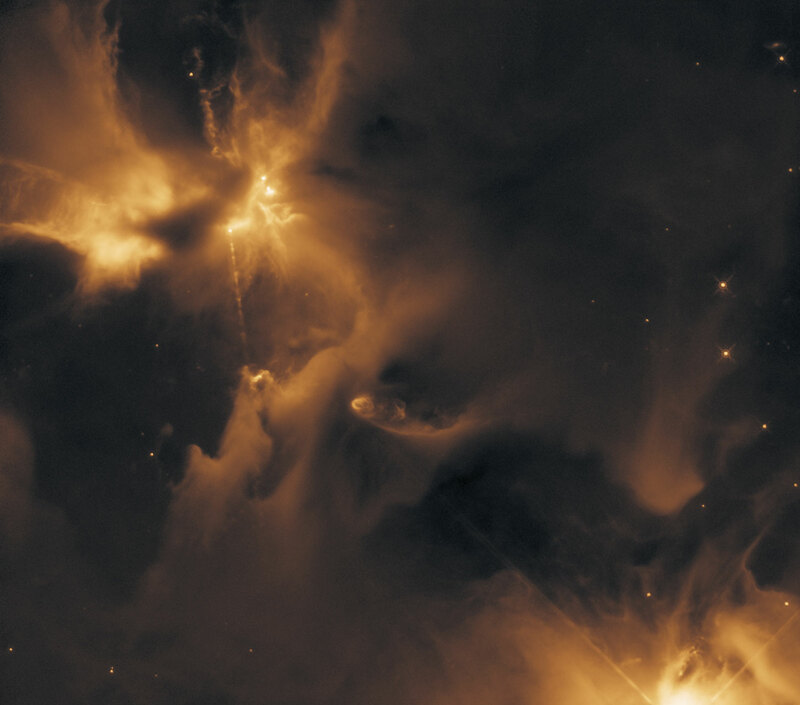 By detecting these particles and charting the directions they come from, scientists aim to identify the sources of neutrinos: star-forming galaxies, supermassive black holes or perhaps some as-yet unknown violent objects. These sources can accelerate neutrinos and other subatomic particles to energies far greater than any human-made machine could achieve. IceCube was specifically built to aid in this quest. 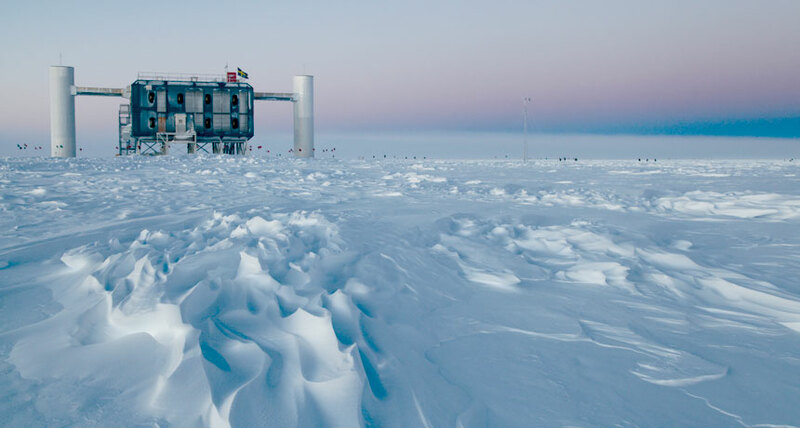 For three years, strings of sensors stretching as deep as 2.5 kilometers below the surface of an Antarctic glacier have detected subtle flashes of light created when neutrinos and other particles collide with atoms. Last year, IceCube researchers identified 28 high-energy neutrinos from all directions that are almost certainly from outside the Solar System. The researchers have since found nine more, including the highest energy neutrino ever detected. That left Weaver with about 35,000 neutrinos, at least some of which began their journeys beyond the Solar System. He tracked the directions they came from and found no evidence of clustering in any particular parts of the sky – a finding that confirmed previous analyses and suggests that no local source is primarily responsible for the population of neutrinos whizzing by Earth. As IceCube continues to collect more data, scientists hope these two independent neutrino search methods will converge on trends in the neutrinos’ direction of arrival. It’s an exciting time in neutrino astrophysics. The Sloan Digital Sky Survey (SDSS) is one of the most ambitious and influential surveys in the history of astronomy. Over eight years of operations it has obtained deep, multi-color images covering more than a quarter of the sky and created 3-dimensional maps containing more than 930,000 galaxies and more than 120,000 quasars. The education team at SDSS have prepared a variety of astronomical resources, interactive tools, and science projects, for teachers and educators to use. They aim to show us the beauty of the Universe, and share with us their excitement as they build the largest map in the history of the world! SkyServer‘s tools allow you to access all publicly available data from the Sloan Digital Sky Survey. It offers access to many different types of data, but most users will usually focus on four types: images, spectra, photometric data, and spectroscopic data. See their ‘Getting Started‘ page for more details. Their projects pages come in both Basic (suitable for high-school and Astronomy 101-level students) and Advanced (for students with a deeper understanding of astronomy) levels. There are also ideas for extended independent research projects. Instructor guides are also available. The achievement, which comes nearly 25 years after the pioneering idea of detecting neutrinos in ice, provides the first solid evidence for astrophysical neutrinos from cosmic accelerators and has been hailed as the dawn of a new age of astronomy. The team of researchers that detected the neutrinos with the IceCube Neutrino Observatory in Antarctica published a paper describing the detections on November 22, 2013, in the journal Science. While not telling scientists what the cosmic accelerators are or where they’re located, the IceCube results do provide scientists with a compass that can help guide them to the answers. Unlike other cosmic particles, neutrinos are electrically neutral and nearly massless, so that they travel through space in a straight line from their point of origin, passing through virtually everything in their path without being deflected by interstellar masses and magnetic fields. The IceCube observatory consists of over 5,000 basketball-sized light detectors called Digital Optical Modules (DOMs). These are suspended along 86 strings that are embedded in a cubic kilometer of clear ice starting 1.5 kilometers beneath the Antarctic surface. Out of the trillions of neutrinos that pass through the ice each day, a couple of hundred will collide with oxygen nuclei, yielding the blue light of Cherenkov radiation that IceCube’s DOMs detect. Links: LBNL press release; U. Wisconsin press release (with image gallery); Penn State press release (with movie).